The Merging of the Genres.. The very idea 10 years ago that the sub-genre ‘shooter RPG’s’ would become one of the most popular game genres if not the most popular would have been ridiculous. Granted both the shooter and role playing game genre are possible the most popular of the gaming genres and in my opinion are, they had never really been mainstream together and that’s why it was classed as a ‘sub-genre’. 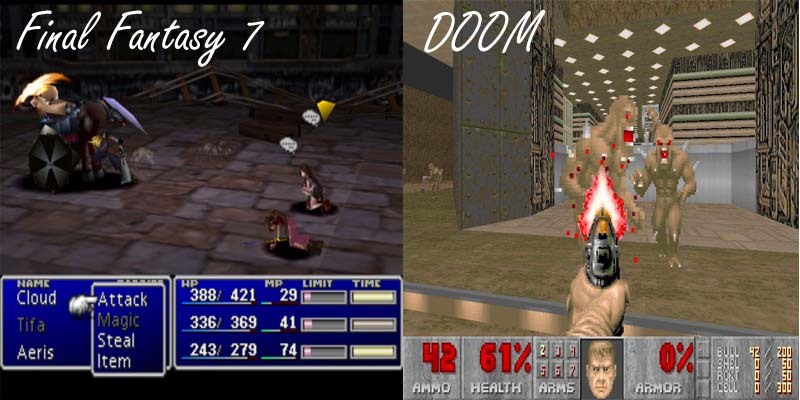 I have chosen two images from each of the game genres I want to explore; the first image is from Final Fantasy VII (7) a role playing game and for the first person shooter genre I have chosen an image from DOOM. Personally I haven’t played either of these games but I know a lot about them and I plan to in the future, and the reason I have chosen these images is because each game is arguably the pinnacle of each genre and a good jumping of point to delve deeper into these individual genres and to explore the theme of play within each. I will talk about each genre individually, why they are so popular and then about how they have merged in recent years to create the popular game series Mass Effect, Far Cry, Fallout, Borderlands etc. “[Play] is the structuring activity, the activity out of which understanding comes. Play is at one and the same time the location where we question our structures of understanding and the location where we develop them” – James S. Hans, the play of the world. I’ve decided to explore the theme of play because I felt it would be the most interesting and the subject matter I could speak about the most because of my knowledge of games. There are many different definitions and types of play, in the terms of video games the term gameplay gets branded around a lot. Gameplay is basically defined as when players follow the rules of the game through the system it is on, usually a console or a PC. Personally when I think of the term ‘Play’ I think about video games initially, and then if I think of it further I think of it as any type of stimulant that involves rules and some sort of objective or goal. But there I think I am defining a game or gameplay more than the term ‘Play ‘on its own but that is how I think of it. Really play can be anything from throwing a ball at a wall to playing the most advance game possible, it’s what the player makes of it. Niko Silvester on about.com defines a role playing game as a video game where the player takes control of one or more characters to complete a quest. This is true but to expand on it further you take control of a fully developed character either by yourself by playing the character or because of the extensive backstory created by the developer or a bit of both. You take this character on a series of quests or missions which is how this character develops, it’s usually by collecting experience and increasing abilities which are normally strength, magic, archery or variations on them. Also a part of the character development is collecting items like better armour, potions and other belongings of this nature this makes inventory management important in most RPG’s. The games will normally take place in an open world of sorts where the player can deviate from the main quests and explore and complete side quests. The majority of these game play mechanics have developed from role playing board games, most notably Dungeons and Dragons which includes character stats, character classes, NPC’s and items these are all still included in the majority of modern role playing video games. Going back to the image of Final Fantasy VII, this is one of the most popular role playing video games of all time and is widely regarded as the best ever. The image itself isn’t important I just chose it to represent the game because I wanted to speak about it. To expand on why I chose this image and Final Fantasy VII in general, this is because it represents everything that a role playing video game should be, it has an extensive story, interesting and detailed characters, good combat system, Big immersive world, exploration and much more. It is the classic style RPG with its turn based combat system and the free roam style, this makes it a thinking man’s game. This is in stark contrast to the classic shooters which are all about the player’s reaction speed and killing as many enemies as possible, a prime example of this is DOOM. The shooter game genre is technically a sub-genre of action games but in recent years they have probably become the most popular games so I think they are becoming a genre in their own right. There are two main types of shooters and they are divided into perspectives, first person, for example Call of Duty and DOOM of course plus third person shooter games like Gears of War and Resident Evil. Classic shooter games are about running and gunning and the only things you will collect along the way are weapons, ammo and health. This is in contrast with an RPG where you are always collecting new items that go into your inventory, which you don’t have in most shooters. The gameplay focuses more on keeping the player in the action rather than levelling up your character or other aspects of developing your character. The story lines are linear and not in open worlds so exploration isn’t a key factor like in role playing games, again this is to keep the player constantly in the action. You normally play mission by mission until you complete the game and there are no side missions and if made badly they can feel quite methodical. The majority of these key gameplay mechanics and features are very contrasting with role playing games especially the combat system where in shooters it is all about reaction speed and in RPG’s it’s all about thinking what the best strategy. Looking at the game in my image, DOOM is a leading example of what makes a good classic shooter game, hence the reason I chose the image and it is also regarded as one of the most important video games of all time. DOOM is all about action you are constantly fighting with no let up, there is no dialog and the story is basically just that you need to defeat all the demons. This exciting and fast paced game play is what created the mid-90s popularity of first person shooters. The games emphasis is defiantly not on the story and it’s not an important factor in why it became so popular. I’ve explained why both the role playing game and shooter game genre are so popular on their own and talked about the gameplay mechanics and what makes each of them great in their own right. Now I’m going to move onto how these two completely different genres have merged over recent years to become one of the leading genres around the ‘shooter RPG’. “Computer RPGS have a great potential for covering many new exciting genres. It seems that it will be a long road of experimentation with a few disappointments along the way, before we draw the attention of the mass audience to this niche genre, and deliver a major hit” – Ilya Stremovsky, Games designer at Nival Entertainment – Game guru, role-playing games (p.7). I think this is a really interesting quote and it is exactly what I am talking about with the emergence of shooter RPGs. The book was released in 2004 so the quote will have been made around that time and I think he is talking about how the RPG genre has all the elements that can be involved into other gaming genres to make better overall games. He saw the potential that RPGs had to become as mass market genre which it wasn’t really at the time, especially in Europe. I think this is what has been happening in recent years, RPGs and shooter games have merged to create games that are really popular to the mass audience, and this is what he predicted. Games I mentioned in my introduction like Far Cry 3, Borderlands and Deus ex have proved that point, and show he was correct. So why is the shooter RPG genre so popular? In my opinion it’s because it has brought both of the markets together, shooter and RPG fans both like the games so straight away that is bringing a bigger audience to the game. Secondly I think the intense fast paced action of a shooter and the open world factor of an RPG goes really well together. And finally I think one of the biggest aspects of why people like them is that it is human nature to develop and grow, and this happens in these games by gaining skills and items, it gives you more goals and makes you care about the time you put into a character. Although some RPG purists don’t see this mix of the two genres and the subsequent games being RPGs anymore, I do, they include the majority of the features that arguably the greatest RPG of all time ‘Final Fantasy 7’ has. They have the open world, side quests, in depth story line, character development and many more other feature. The only feature they don’t have in comparison to old RPGs is the combat system; obviously it’s an intensive shooter for this genre. If the RPG elements where taken away from these games they could easily stand alone as a skilled shooter game, especially the Far Cry 3s and Borderlands of this world and vice versa, it could be a full RPG and still be a stand out game. It’s just when they come together they make the game more and this is shown by the awards the games have won, prime example Fallout 3 winning game of the year and multiple other awards. So overall I think the move of game developers to mix these two well respected genres together is a good thing and will bring more people to experience each type of game. And what I mean by that is that fans of RPGs will experience shooter games and fans of shooter games will experience RPGs. I personally used to only really play shooter games like call of duty, medal of honour and other games of that type. But since I started playing shooter RPGs, like the original mass effect which I picked up because I just thought it was a shooter, I became to like RPGs more and more and now I will by a game in that genre over any other. So the merging of the genres must be a good thing because if I was narrow minded like that other people must have been as well.